XIA Junsu is back with his fourth solo album XIGNATURE; XIA has this time collaborated with artists such as Jung Key and Sunwoo Jung Ah to write a collection of impressive tracks. Alongside this album comes a music video for title track Rock The World. XIA Junsu is one artist we can always rely on for an interesting music video, and Rock The World is no different – even if just for the impressive choreography. Though there is some important imagery packed into this video. The basis to all of this imagery is Junsu chained and confined in a glass fronted prison. This is the visual representation of Junsu’s position in Kpop previously – on show to all, but restricted with no personal control over his situation. 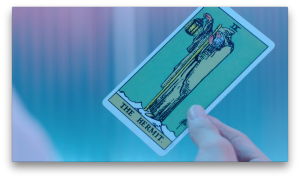 It is then the tarot cards we see throughout the music video that provide us with the full narrative and deeper understanding. 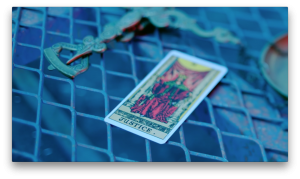 The mv begins with the Justice card. This card is one of the more simple of the Tarot pack and means exactly what you’d expect: Justice, fairness, truth, cause and effect, law. This symbolises the recent judgements that were made surrounding SM companies blocking the appearance of JYJ members on major television networks and at prominent events. Although technically these things can probably still happen it is unjust to do so, and proof of it happening will provide means for legitimate legal action to be taken. This is almost a title card to the music video, showing the conclusion before the narrative unravels. The next card we see is The Hangedman. 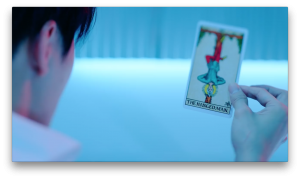 A complicated card, the Hangedman represents sacrifice and restriction – as the visualisation of Junsu chained up also does. This is the card that most relates to his solo career to this point, as due to the restrictions unfairly put upon him he has had to sacrifice many of the elements of his idol role. It is this card that will become one of the most important later in the video. Next up, The Emperor. The Emperor is seen as a solid foundation, authority, somewhat a father figure. This image is reflected onto Junsu as the next shot sees him sitting upon a throne – an image often used by Junsu, and maybe rightly so. Despite the restrictions he has faced Junsu is still one of the most influential, and richest, of Kpop’s idols. 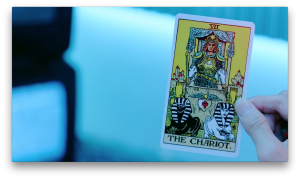 The Chariot appears during the rap by The Quiett, and is a card relatable to both The Q and XIA. The Chariot symbolises control, will power, victory, and determination. Essentially the things The Q raps about, given his rise from the underground, these are also things Junsu has had to display to fight against those opposing him. Looking a little deeper into the card you see that the charioteer has the city behind him. This is representative of him leaving behind civilisation and materialism in order to enhance his spiritualism. Applied to the Rock The World mv this likely represents both The Q and XIA having to follow unconventional means to reach success. The Hermit, another card that appears as The Q raps, and apt for both artists. Representative of soul-searching and ones inner guidance this too has parallels in the ways both have had to work tirelessly outside of the mainstream norms to reach their current level of success. The next card we see is The Empress, and this card appears just after we see a female blindfold Junsu, and this is rather important. The Empress is the Earth Mother, she symbolises fertility, and beauty, but she’s far more complex than that. The Empress encourages connection with our femininity, though our femininity isn’t necessarily an outward thing. Femininity actually translates to many things when associated with The Empress, including creative expression. The Empress in Rock The World is not a female in Xia’s life, she is music, she is Kpop – she both restricts him and encourages him. This is further shown by the female’s role as the puppet master, controlling Xia (and one of the dancers), in the music video. 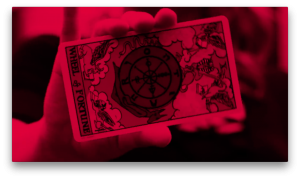 Though this is about to change, as the next time we see a female in the music video she is holding, and destroying, the card The Lovers. This card is another simple one, symbolic of love, union and value alignment, the destruction of it counteracts this. This is both very significant to the attitude of SM the big names in the industry upon Junsu departing from his group; and the determination of Junsu to succeed despite the situation presented to him. There is no harmony and love between Junsu and the Kpop industry, only ill feeling. The Wheel of Fortune is next to appear, and its presence from upright to reversed becomes symbolic of life cycles and destiny out of control. As long as it is moving, and not fixed in either position it is neither good or bad luck, nor can it be determined who is in control. 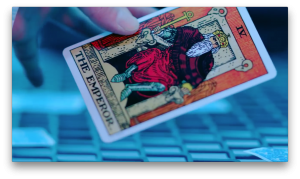 Though its depiction in the music video seems to have Junsu himself turning the card – a good indicator that this card at this point is showing Junsu taking control of his destiny. Then the Hangedman returns. This time Junsu turns the card into its reversed position and it takes on a whole new meaning. Junsu is no longer suffering, now he has looked at his situation from a whole new perspective. This suspension of his control has given him time to recognise the truth, and see what he can change. He is the martyr, a willing victim that has chosen a path of sacrifice to achieve a higher goal. It is after this realisation that Junsu can accept his fate, and we see him burning The Empress. Junsu is taking control of his life and music, and that doesn’t include him submitting himself to The Empress, or external influences on his music, any more. But this doesn’t mean that Junsu is completely adapted to his new freedom. 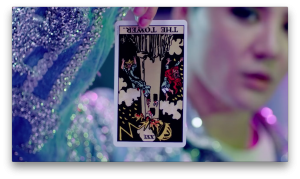 The final card of the mv is the reversed Tower. A symbol of avoidance of disaster, and fear of change, we see that maybe Junsu has become accustomed to living and working with restriction and unlikely to change soon. It has been a slow sixth months for interesting music videos, and XIA just upped the ante plenty, as we expected. If you like this track the full album is available on iTunes for £11.99.